As protected bike lanes have spread from city to city across North America, a problem has followed: snow. Most protected bike lanes are too narrow for standard street plows. So how are cities supposed to keep them clean? Last year, the two of us decided to try and help more cities solve this problem by researching the best equipment to use for clearing snow from protected bike lanes. We wanted something like PeopleForBikes’ past post about the best sweepers for clearing protected bike lanes of leaves and debris. But after talking to city staffers across North America and Europe, we realized that the challenges of winter are different than the challenges of fall. The reason is that winters themselves are so different from city to city. 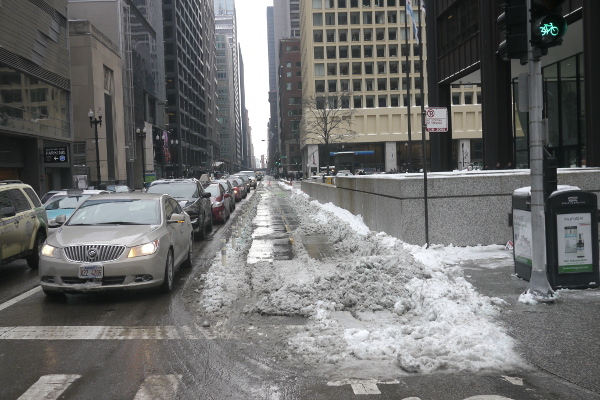 The snow that piles into a protected bike lane in Chicago is very different in quantity, weight and thaw pattern than the snow in Calgary, which is very different than the snow in New York City. Moreover, there’s just not as much variation among snow-plowing equipment. As one staffer we spoke to put it, the perfect plow rig for your bike lane is the biggest one that isn’t too big. So the fact is that there’s no single set of equipment we can recommend for most cities. Instead, we’ll spend a bit of time on equipment, and then share some other lessons from our conversations with cities. Demo video for the Wille 265. It’s just under 4.5 feet wide, with a 118-inch outside turning radius. Though there’s no single best snowplow for a protected bike lane, some generalizations are possible. If you’re in a city that plows some of its sidewalks, the same equipment will probably work for bike lanes. For larger snowfalls on its campus’s 10-foot-wide, 2/3-mile protected bike lanes, the university switches to a Ford Ranger pickup. In Boulder, Colorado, the city clears its widest protected lanes with a Ranger and plow, too. On narrower facilities it uses a Gator brand all-terrain vehicle made by John Deere. For other jobs, it uses a Caterpillar mini-loader with a power broom; for a few, staff just haul out a snowblower. Washington D.C. uses a 60-inch-wide Toolcat 5600 but has been in the market for something smaller, to make turns while clearing a five-foot protected bike lane. In 2015, Salt Lake City started using a 65.5-inch-wide Kubota RTV1100 to sweep and plow its protected bike lanes. For narrower spaces in its downtown, SLC uses a 44.9-inch-wide Kubota F3060. The widest part of that tiny tractor, not currently manufactured by Kubota, is its 51.1-inch wheelbase. Another option on some smaller plows: attachments for brine or salt, offered for (among others) the 51.2-inch-wide Wille 265 and the 56-inch Wille 365. Several days after snowfall on Dearborn Street, Chicago, in 2014. The city changed its practice that winter to assign the job to its standard streets crews. Photo: Steven Vance. Clearing protected bike lanes of snow requires more than equipment. It requires a plan. Simply because they rarely carry vehicles large enough to break ice, protected bike lanes may shut down for days if they’re not treated quickly. But when snow is newly fallen, roads everywhere are crying out for plowing. Does this make protected bike lanes a higher priority than arterials? How about certain protected bike lanes? Under what circumstances is a protected bike lane a higher priority than its adjacent roadway? When is it a lower priority? Cities should base these decisions on the principles that drive all their transportation work. They should also post them publicly. They act as promises and can be codified through a city policy or ordinance. Priority Network: Which routes are the highest priority for snow clearing? Residents should know which routes can be best relied upon for year-round biking. Frequency of Clearing: While some communities specify that snow clearing will happen within a certain time period after snowfall has ended, leading winter cities specify the amount of accumulated snow that is acceptable before clearing will commence. This approach acknowledges that biking in loose snow can be dangerous. Common accumulation limits are about 1 inch (3 cm). Clear Width: How wide of a path along the bikeway will be cleared? 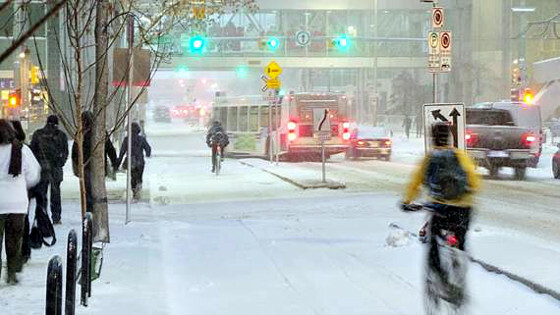 In some cases, a first pass initial snow clearing may be completed that provides a minimum width to allow the bikeway to be operable and allow the public agency or contractor to increase the length of the bikeway network that can be cleared. The new MassDOT Separated Bike Lane Planning & Design Guide, for example, specifies a minimum 4 feet (1.2 m) for the narrowest operable protected lanes. 7th Street in Calgary, Alberta. Photo: Tom Thivener, City of Calgary. Many protected bike lanes have understandably been reverse-engineered around the two or three months of each year when they’re getting blanketed with snow. Snow removal is, in fact, a major factor behind the probably excessive popularity of bidirectional bike lanes in North America. But as we showed in the “equipment” section, the smallest snow removal equipment is less than five feet wide, so cities should consider their vehicle options before jumping to conclusions about lane width. Snow storage is a harder issue. When snow is cleared from a protected bike lane, it usually lands on the left or right: between bikeway and auto traffic and/or between bikeway and sidewalk. Calgary produced a great infographic to help explain where snow should ideally be plowed or shovelled and stored until it melts or is trucked away. But the real world is not perfect. When sidewalks lack furnishing zones or landscaped boulevards, or when snow piles up rapidly in a major storm, it needs to be transported somewhere else. That transportation costs time and equipment. Finland, a very snowy country, has a useful alternative to hauling snow away from bike facilities: instead of pushing snow aside, its machines pack it down until it’s bikeable. We haven’t found any North American city doing this, but some have considered it. Finally, communities must also manage bike-lane ice. Typical ice control techniques rely on a combination of salt, aggregate, and brine treatments, depending on temperature and other factors. Again, local climate must dictate which practices work best on a given day. Sometimes this can bear surprises. 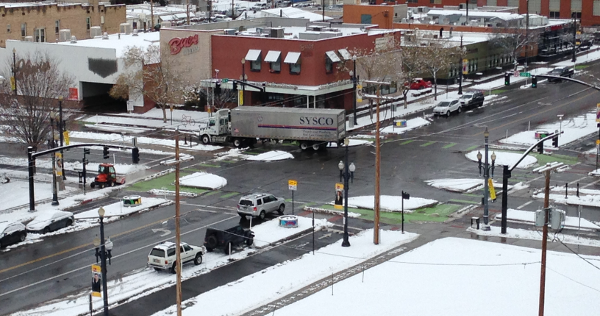 Denver has found, happily, that because bike tires don’t splash away magnesium chloride, it’s a far more effective de-icer on protected bike lanes than in auto lanes. The science, the politics and the practices of snow removal from protected bike lanes is new in North America, but advancing with each passing winter. And unlike so many things about protected bike lanes, this isn’t an area that can simply aspire to European models — it’s an area that North Americans are exploring for themselves.